This silk jersey turban with feather and diamante clips was designed to be worn as an evening or cocktail hat. 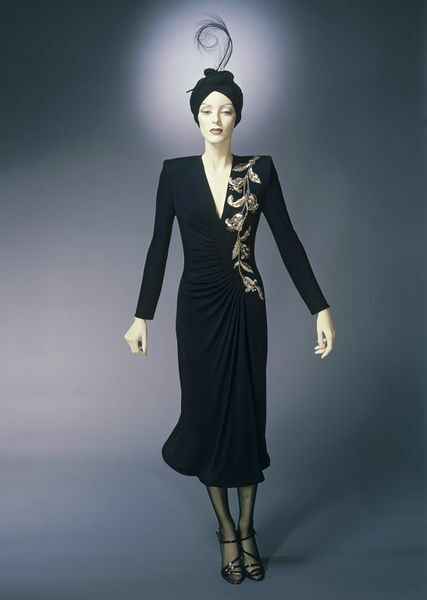 It was acquired in 1979 as part of an outfit along with a dress designed by Murray Arbeid. Both the strong shoulders of the dress and the high turban style of the hat reference fashions of the 1940s when such pieces were very much in vogue. The hat was designed by one of London's leading 20th century milliners Frederick Fox. Australian-born Fox moved to London in 1958 where he worked with Otto Lucas and Mitzi Lorenz before establishing his own millinery salon in Brook Street in 1964. His clients included Royalty and he designed many hats for the Queen. He retired in 2002 and returned to Australia, becoming a patron of the Australian Millinery Association. Black jersey turban trimmed with feathers. With diamanté clips. This hat was acquired as part of an ensemble comprising a Murray Arbeid evening dress (T.183-1980), shoes and stockings (T.184,A-B-1980). The complete ensemble was donated in 1979 with a customised Adel Rootstein mannequin specially made for the purpose of modelling it. This was part of a group of 25 such total ensembles donated in 1979.